Samsung Pay today has reached a milestone since its launch six months ago in Korea and later on in the United States: the service now has 5 million registered users who have processed over $500 million in transactions. Currently, Samsung Pay is only available on Samsung's top-end phones: the Galaxy S6, Galaxy S6 edge, Note 5 and the Galaxy S6 edge+, but in 2016 it is already available on the new Galaxy A7 (2016) and Galaxy A5 (2016). Big news is that Samsung Pay is now officially confirmed to be coming to China in March, and later this year in Australia, Brazil, Singapore, Spain, Canada and the U.K.
Samsung says that Pay is getting adopted quickly and has a growing support of banks with over 70 total supported banks. Unlike Apple Pay and Android Pay, Samsung Pay supports not only NFC terminals, but also legacy MST terminals that are usually found at smaller retailers. MST or magnetic transactions use the same technology that is used in credit and debit cards, so compatibility with these older terminals makes Samsung Pay much more likely to work in places where Apple Pay and Android Pay won't. Samsung Pay is rocking. I've probably use it at least 100 times since owning my Note 5. It's so nice. I just carry my phone, license and my debit for just in case and I have Samsung with my Chase and AmEX, and Android Pay for my other cards and Discover. This is why choice is awesome. Innovation in the palm of my hand, at an awesome day price point, and no pretending to be a phone it isnt. "I froze a terminal and my phone attempting to use Samsung Pay at Office Max (or Depot, IDK Which one). I didn't realize they had NFC enabled and I tried to use MST and for whatever reason my phone froze and then the terminal froze and no more transactions could be done until it was reset. I have no idea what happened. I should've emailed the Samsung Pay team as soon as it happened but I forgot. That was probably the most awkward situation I've been put in with Samsung Pay and it wasn't really that bad despite looking like an idiot in front of the cashier but I'm sure he's forgotten it by now. I ended up just swiping my card when everything was up and running again." You can still use MST on an NFC terminal. I do it all the time at Walgreens. When you swipe up on your card, the phone will automatically turn on NFC and turn it off again when you are done. You can choose which one to use. I am so used to using MST, that I don't bother even trying NFC. How is "placement" ease of use? I only ask because I plan on getting an S7 when I can upgrade in May. Many people say that their phone needs to be placed in a specific location and if its off a bit, it wont work. /shrug. Been doing a lot of research digging for when I upgrade. Hopefully my bank (Wells Fargo) gets supported soon. Nah, it pretty much just works. If the terminal has NFC, place it there. If not, hold it over the swipe groove. If you hold it over the groove and it has NFC, it still works via MST. You just sound a liar. I've used my phone at Office Depot with no issue. I too have had my phone freeze for a few seconds before. I never had a reader fail. I went to a Crack Barrel and even though it just wouldnt accept it, it did notice. So you had one bad experience. Is that the end of it? Have you not ever swiped your card an not have ut work? You just like like a complaining hater. Get an iPhone and good luck using Apple Pay. I use Samsung Pay everyday. I now have 4 credit cards and a debit card registered to it. I pay at pretty much evert place I shop at except for sit down restaurants where you give your card to a server to process. Although at some restaurants they now have the tablets that double as credit card payment terminals and I can use Samsung Pay on those using MST. They just need to get Wells Fargo and Capital One on board. Those are the last two major hold-outs. I dont think capital one is happening anytime soon since they just released/announced their "wallet"
Yeah, I agree with you and that is unfortunate. I signed up for Bank of America VISA last August and never looked back. I still have my Capital One card, but my cancel it because I don't use it anymore. All all these users in the US and South Korea? I hope the anounce tomorrow that coming to the UK in March / April. 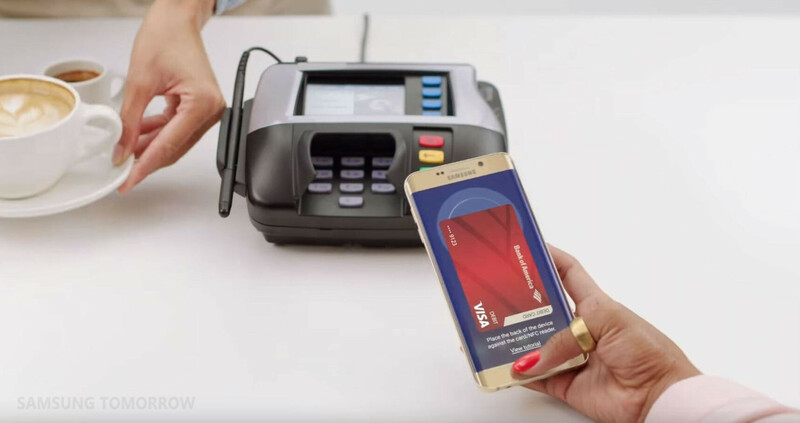 Samsung Pay is king Mobile payment. However, Samsung loose many customers on Knox, specially rooted phone even after went back full stock. You lost Samsung, if not fix. Only one problem with releasing in China: Everyone buys Chinese brand phones! Bought S6 only because Samsung Pay and no need bring along wallet. But after almost 1 year and still not support in Nordic Countries. Too slow Sammy.